Το Bann Chom Le, στην περιοχή Κλονγκ Μουάνγκ σε Krabi, αποτελεί δημοφιλή επιλογή για τους ταξιδιώτες. Από εδώ, οι επισκέπτες μπορούν να έχουν άμεση πρόσβαση σε όλα όσα η πόλη έχει να προσφέρει. Με την βολική του τοποθεσία, το ξενοδοχείο προσφέρει εύκολη πρόσβαση στους προορισμούς της πόλης που πρέπει οπωσδήποτε να δείτε. Το Bann Chom Le προσφέρει άψογη εξυπηρέτηση και όλες τις βασικές ανέσεις στους ενθουσιώδεις ταξιδιώτες. Αυτό το ξενοδοχείο προσφέρει πολυάριθμες εγκαταστάσεις για να ικανοποιήσει ακόμα και τους πιο απαιτητικούς πελάτες του. Απολαύστε ανέσεις υψηλών προδιαγραφών κατά τη διαμονή σας. Ορισμένα δωμάτια περιλαμβάνουν καθρέφτης, πετσέτες, κλιματισμός, μπαλκόνι/αίθριο, ανεμιστήρας - ό,τι πρέπει για να αναζωογονηθείτε μετά από μια γεμάτη μέρα. Το ξενοδοχείο προσφέρει μια άριστη ποικιλία ψυχαγωγικών εγκαταστάσεων, όπως τα εξωτερική πισίνα. Απολαύστε τις ασύγκριτες υπηρεσίες και μια πραγματικά περίβλεπτη διεύθυνση στο Bann Chom Le. Very friendly staff, cam and a very nice beach. I would com again! Bungalow was nice. View was amazing. room flexible for environment 2-3 set for towel and shower set very nice and good for skin , toilet very clean and toilet shower very clean also , water for shower is cool enuff for mix hot and cold water, include coffee set additional full service in room and room clean nice staff but we go on low season that no restaurant support swimming Pool have nice and clean near by room beach front. 1 mins to the fine beach; bamboo cabins with ocean veiw and sleeping with the sound with waves; staff are very nice and helpful; clean, with hot shower. And again the dreamful beach, you can even making your wedding photos here! Not next to any thing. Hard to find restaurants. Very inconvenient. Beach wasnt that nice. If you wanna be cut off from society then i guess you’ll like it. The staffs were amazing though. They were very helpful. Probably the best part of the stay. If you want unusual these huts offer that , the only thing was with ours, frontline the best view in the world to get out of bed to, bed difficult as the bed is on the floor, then down a step to the outside bathroom, which was dangerous if not very careful. I would not pay for the breakfast it is not worth. The huts at the back have proper beds, the location is beautiful, in all the concept is excellent . 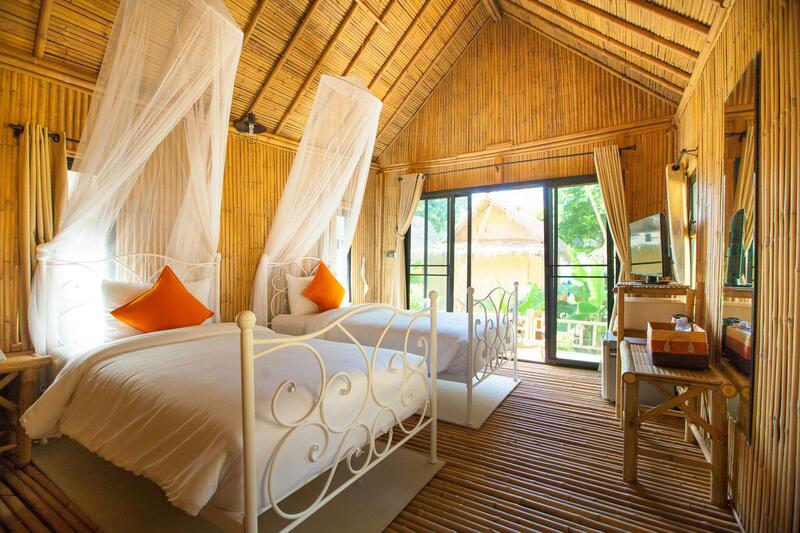 The bamboo bungalows are very nice located on the beach, nice pool. Breakfast is good, eggs not included. Juice could be better. Coffee is ok. Staff very friendly and helpful. The room and the location of this place are superb! Right next to the beach and not too crowded by tourists like Aow Nang area. Staffs were very helpful. The only point for improvement was breakfast which wasn’t too much variety. Definitely will visit again forsure. Everything was nice during our stay there - relly cozy palce for relax. Highly recommended, but don't expect much for this price - ...for example breakfast is basic (but good), no gym, etc... Same time got swimming pool with jacuzzi. Great location! But everything else was terrible. The floor in the room had nails sticking up requiring shoes. No way to clean the floor because made of round pieces of bamboo. Bathroom door with no way to close or lock. Bathroom had no windows or screens. You could look up through the elevated floor and see people clrearly in the bathroom through the bamboo floor. The staff put us in their worst room, the furthest from the beach leaving the other 15 bungalows empty. Perhaps because we paid half price with Agoda. We were the only guests. They tried to charge an extra 3% for payment by visa. The breakfast was plastic with no taste. Do not go there unless the price is less than 300 baht. This is a backpacker place! I cannont recommend this place enough. We stayed to get off the beaten track of Krabi and find somewhere to relax over the holidays and this did not disappoint. 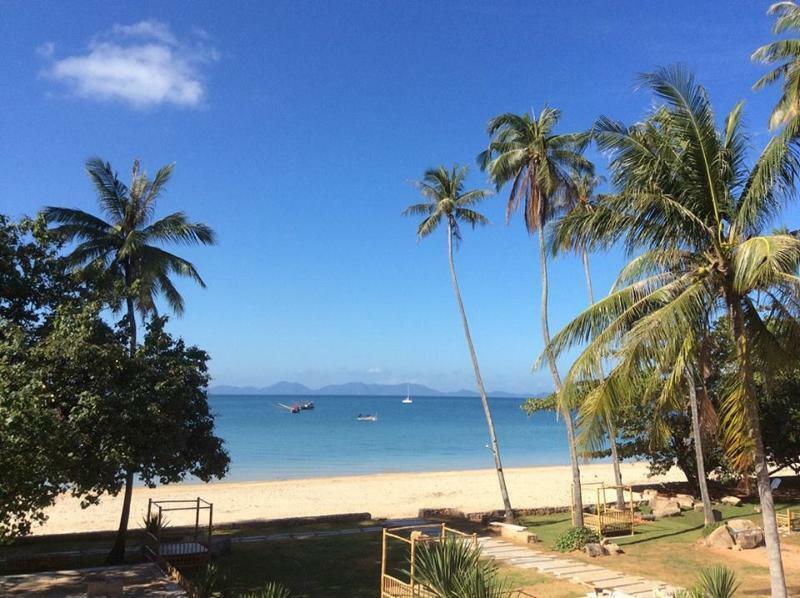 For those looking for a great hut (and I say hut lightly as these were basically little condos), beautiful beaches and the quieter side of Thailand, this is perfect. Very different vibe to the rest of this area, and this is easily the most accessible place to stay with regards to budget too. Amazing place. It´s nice and calm accommodation away from crowded tourist beach. Bamboo cabin with air conditioning was cozy and clean. The staff is very helpful. Wonderful family location with a pool and lounge chairs on the pool deck. Buffet breakfast had a good variety of food options for all nationalities. Free bicycles for guests to use. Clean, comfortable, spacious rooms. Five minute walk to the beach. Close proximity to restaurants. The whole surrounding area is being upgraded with storm sewer, street lighting, seawall walkway, shops and restaurants. Once completed in a few months, the area will be very nice. Cute little shacks right on the beach.